Here at Palisades Presbyterian Church we seek to deepen our faith and our relationship with God, others and ourselves through fellowship and study. We strive to make our offerings diverse and include: an ongoing weekly Bible Study, book discussions, potluck suppers and movie nights, labyrinth walks and lectures on relevant topics related to faith and our world today. Our inward journeys are always intentionally outwardly based. Our Sunday School program currently consists of four classes on Sunday morning in the Parish House. 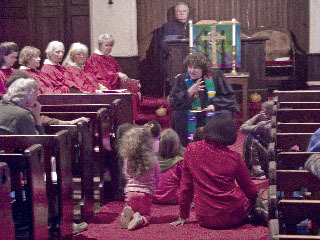 Children are invited to begin worship with the congregation at 10:00AM, and then may be excused to the Parish House after the children’s sermon to go to their class. The Toddler-PreK class is upstairs in the playroom. Children of any pre-school age are welcome. Parents may stay with their children if necessary. They are read a bible story, color, and do a small craft project according to their ability and attention span. The Kindergarten to second grade class meets in the right side of the double classroom. Children are presented with bibles from the church when they ‘graduate” from this class. The third to fifth-grade class meets in the small room. The sixth and seventh day grade class is in the left side of the big room. Youth Group (grades 8 to 12) meets from 5:30 to 7:00 PM two Wednesdays of the month- check calendar for dates. All youth are welcome!